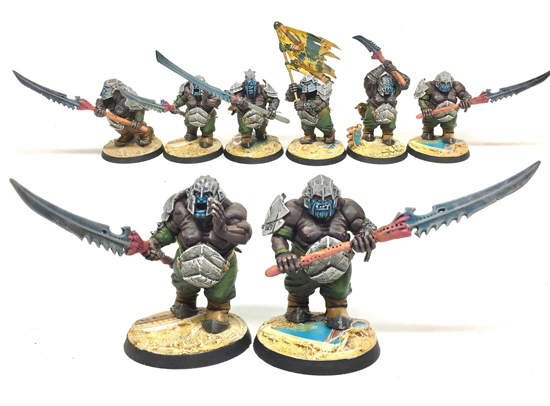 Today I have a special guest article by Eric "Stonemonk Gamer" of the Mortal Realms. 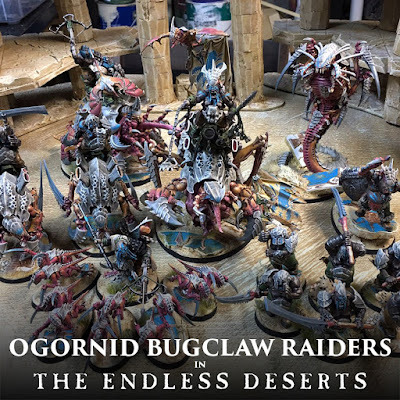 His Bugclaw Raiders army is awesome on many levels, not least of which is that he managed to incorporate Tyranids into AoS and have it seem logical, fitting, and pretty cool looking to boot! Huskard Tarkos sat upon his Stonehorn, Right'orn, tightening the furs around his shoulders. He could feel the tip of the Everwinter's fingers grip the caravan. If they didn't pick up the pace, they'd lose some of their numbers by sundown the next day. He prodded Right'orn to move up alongside Carvack, the mount to Frostlord Hotgut, "The 'winter caught us a bit faster dis time Frostlord, the Endless Desert could break dis curse, can I ready the caravan to pass through da hidden realmgate? We are close." Hotgut grunts with frustration, "Da winter aids us in our hunt an' our foes bow to its power! We keep just out of reach until we need it, but we don't abandon da link we have to it. Know yer place Tarkos, an' prepare for one more camp before our push tomorrow." Tarkos rallied the caravan for camp and just after nightfall he left the encampment with a few ogors and beasts that shared his vision. As they approached the hidden realmgate that the scarab compass led him to, he looked back towards where they had left the caravan. They all watched the Everwinter arrive earlier than the Frostlord was able to predict, and it encased the caravan in ice. Tarkos snorted and stepped into the Realmgate. Somewhere in my google searches for reference an idea struck me to stick an ogor on a Tyranid and I couldn't let it go. I mocked up an initial concept in photoshop, passed it by Davy, got a sliver of a positive response "...looks pretty sweet!" and I had to dive deeper. Beastclaw Bugclaw Raiders, here I come. 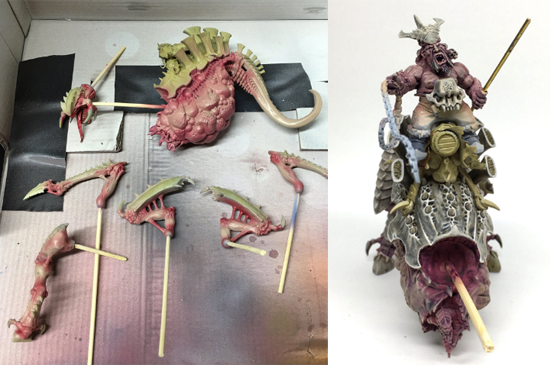 Proof of Concept - Ogor ended up being much larger in comparison which was great. 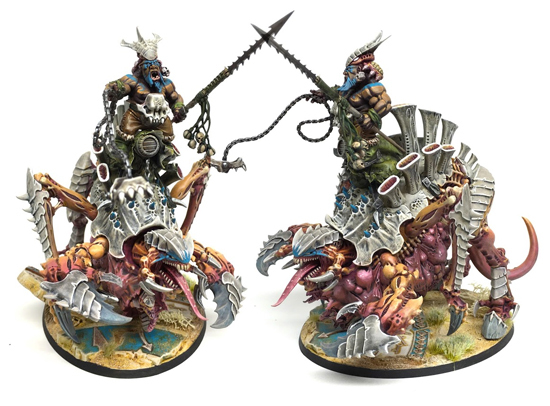 While this one seemed to be a cool idea, I had to make sure I could represent the whole Beastclaw with the Tyranid range. 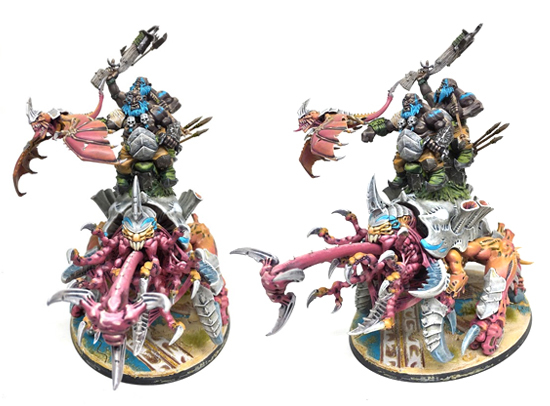 One of my favorite part of any armies is googling model ranges, exploring colors, and the comparing of Beastclaw models and Tyranid models was...unexpectedly in line. The hardest part was having no idea exactly how big the models actually were. I got some help from google searches to get some ideas, but in the end, I Had to bite the bullet and get started. 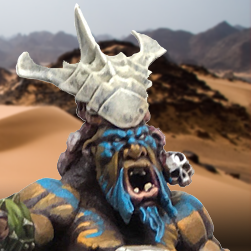 Of course, the most important model to get right in a Beastclaw Raiders army is the Hero on Stonehorn. I was really pumped with the results. You can see that the ogor is much bigger in comparison to the Tyranid model than I had mocked up, but it worked well. This was also my first airbrush project, and the biggest kit I'd worked on since Nagash in 2014. So I dunked all my ogors in Purple Power and picked up some more kits and went all in. Actual Mournfang were decimated in the making of this army. From gluing the materials down to highlighting the details up. Loved what the Wood Putty did for creating those wind-blown contours. 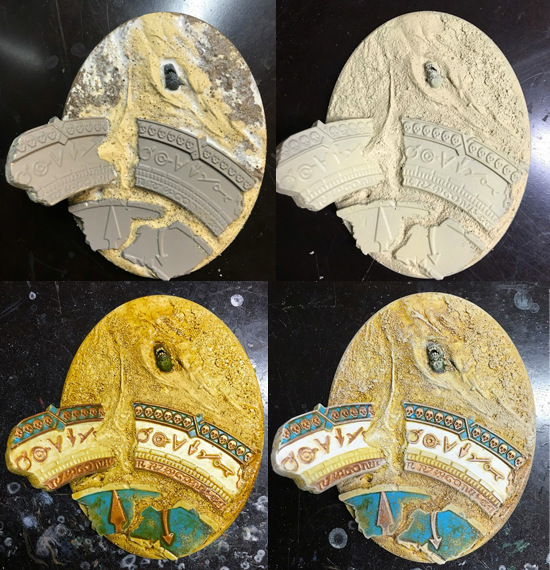 Using cork to add depth to the Shattered Dominion pieces for sandstone slabs jutting out of the sands. Satisfied with the results it was time to kick into high gear to get this army done by Holy Havoc. 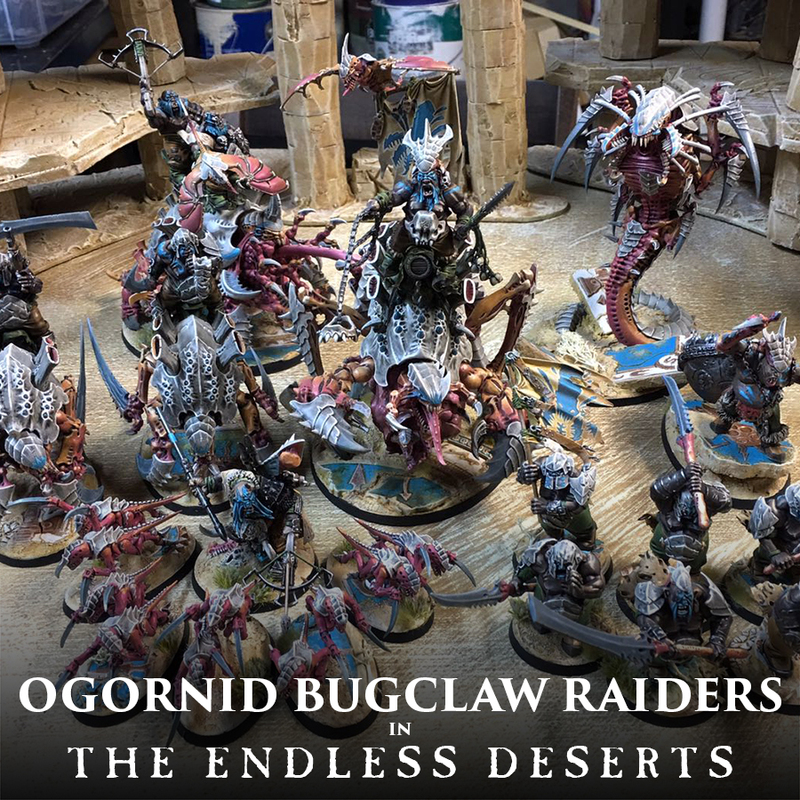 As I did, I shared my progress on the TGA forums and had a huge amount of support and excitement around this army. With that energy, it was a true joy to build this army. So here are the pieces I took to Holy Havoc! Nidlord Tarkos on Stone'ifex - Frostlord/Huskard on Stonehorn. Follow more progress on my The Grand Alliance forums Destruction WIP thread. 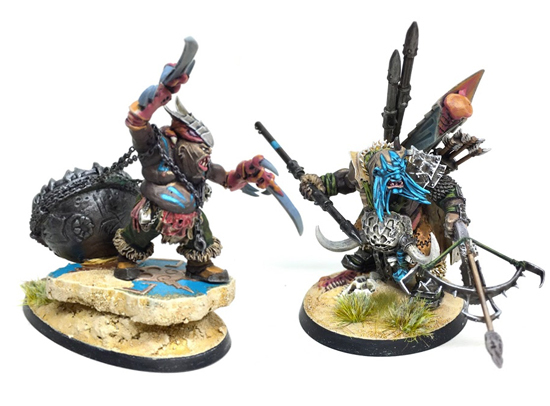 You can hear me talk about games played with them on the Mortal Realms podcast. Tyler: Thanks again to Eric for taking the time to put this together for Mengel Miniatures. 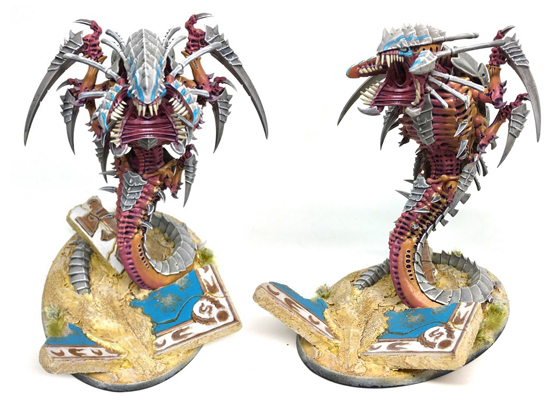 I definitely look forward to seeing this army expand, and hopefully at some point my Tomb Kings will get to face it down across the tabletop for control of the Endless Deserts.